El Al Israel Airlines Ltd. (TASE: ELAL), trading as El Al (Hebrew: אל על, "To the Skies" or "Skywards", Arabic: إل-عال‎), is the flag carrier of Israel. Since its inaugural flight from Geneva to Tel Aviv in September 1948, the airline has grown to serve over 50 destinations, operating scheduled domestic and international services and cargo flights within Israel, and to Europe, Middle East, Americas, Africa, and the Far East, from its main base in Ben Gurion Airport. El Al is the only commercial airline to equip its planes with missile defense systems to protect its planes against surface to air missiles, and is considered one of the world's most secure airlines, thanks to its stringent security procedures, both on the ground and on board its aircraft. Although it has been the target of many attempted hijackings and terror attacks, only one El Al flight has ever been hijacked and did not result in fatalities. As Israel's national airline, El Al has played an important role in humanitarian rescue efforts, airlifting Jews from other countries to Israel, setting the world record for the most passengers on a commercial aircraft (single plane record of 1,088 passengers on a 747) by Operation Solomon when 14,500 Jewish refugees were transported from Ethiopia in 1991. El Al offers only kosher in-flight meals, and does not fly passengers on the Jewish Shabbat or religious holidays. In 2012, El Al operated an all-Boeing fleet of 42 aircraft, flying over 4 million passengers, and employed a staff of 6,056 globally. The company's revenues for 2016 were $2.04 billion, totalling losses of $80.7 million compared to a profit of $57 million in 2010. In 1950–1951 El Al expanded its activities in Europe and added new destinations such as Vienna and Istanbul, Athens and Nicosia. On July 31 of 1950 the company celebrated first anniversary of its regular flights program. 1951 El Al pilot's early Israeli passport. Despite the purchase of its Britannias and inauguration of non-stop transatlantic flights the airline remained unprofitable. [further explanation needed] When Efraim Ben-Arzi took over the company in the late 1950s, the Britannias were replaced in the next decade by the Boeing 707 and Boeing 720 jet airliners. El Al acquired its first Boeing 747 jet in 1971. Many[who?] felt it was a risky purchase given the high cost of the plane and fear of attacks, but El Al operations flourished after the purchase. Another Boeing 747 was delivered in 1973 and was used to start non-stop service from Tel Aviv to New York (El Al - Boeing 707s had flown the eastward nonstop since around 1961). In the mid-1970s El Al began to schedule flights from airports outside of Israel that departed on the Jewish sabbath and landed in Israel after it had finished. However, the religious parties in the government were in arms over this, being that this was a violation of Jewish law and contrary to the agreement signed in the early days of the state, in which El Al promised to refrain from flying on the sabbath. In 1982 the newly re-elected prime minister Menachem Begin, brought before the Knesset a vote to ban Sabbath flights once again (it passed by a vote of 58 to 54). Outraged, the secular community threatened to boycott the airline. In August 1982 El Al workers blocked Orthodox and Hassidic Jews from entering the airport. In 1977 El Al established a charter subsidiary, El Al Charter Services Ltd., later renamed Sun D'Or International Airlines Ltd. Two years earlier the airline had suffered its first losses since the late 1950s, largely a product of the global recession. The management changed three times towards the end of the 1970s, until Itzhak Shander was named president. 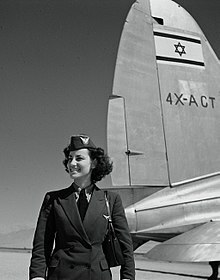 [clarification needed] As the political situation in Iran deteriorated, El Al began to airlift Jews to Israel. All the airline's infrastructure in Iran was eventually destroyed. El Al flights to Cairo were inaugurated in April 1980, following the Israel–Egypt Peace Treaty. In late 1982, after a long period of labor disputes and strikes, El Al operations were suspended. The government appointed Amram Blum to run the company, which lost $123.3 million in the fiscal year ending April 1983. [clarification needed] The airline also sold its stake in Arkia at this time. Later on, flights to Poland and Yugoslavia were started in 1989. El Al flights were inaugurated to the Far East[when?] and, in 1995, El Al signed its first codesharing agreement with American Airlines. In February 1995, the receivership under which the airline had technically been operating since 1982 came to an end. In June 1996, El Al recorded its first flight from Israel to Amman, Jordan. The first phase of the long-delayed privatization of the company commenced in June 2003 and by Israel's Government Companies Authority, headed by Eyal Gabbai. 15 percent of El Al's shares were listed on the Tel Aviv Stock Exchange. By June 2004, 50% of the company had been sold to the public. By January 2005, a controlling share of the company had been transferred to Knafaim-Arkia Holdings Ltd. As of October 2014, El Al's major shareholders are Knafaim Holdings (36%), Ginsburg Group (10%) and Delek Group (10%). In August 2010, El Al and JetBlue Airlines signed an agreement to provide connecting through tickets between Israel and 61 destinations in the United States from October 2010, via John F. Kennedy International Airport in New York. El Al's headquarters are located on the grounds of Ben Gurion Airport in Central District, Israel, near Lod. During 2005, the airline transported 3.5 million passengers, a rise from 3.2 million in 2004 and 2.8 million in 2003. 60% of the airline's passengers are Israeli. In 2006, El Al posted a $44.6 million loss on revenues of $1.665 billion. The company is facing four lawsuits, two of which have been approved as class actions, which could cost the company $176.2 million.[when?] El Al spends $100 million a year to conform with the airline security measures required by Israel's Shin Bet security service. In early 2007, El Al opened a new King David Lounge at Charles de Gaulle airport in Paris. New lounges at Heathrow airport in London and JFK International airport in New York had also opened in late 2007. El Al has a cargo branch, El Al Cargo, which became independent in 1997. As the national cargo airline of Israel, it operates between Tel Aviv, Liege and New York plus ad hoc worldwide charters with one Boeing 747-200F aircraft. Before 2001, when the Israeli air cargo market opened up to competition, El Al Cargo enjoyed a monopoly. Now its main competition comes from CAL Cargo Air Lines. As of 2011, the company employs a staff of 6,056 globally and has a fleet of 37 aircraft. The company's revenues for 2016 were $2.04 billion, totalling losses of $80.7 million compared to a profit of $57 million in 2010. On 26 November 2013, El Al unveiled its now-defunct low cost airline Up, which commenced operations on 30 March 2014, initially to Berlin, Budapest, Kiev, Larnaca and Prague using five Boeing 737-800s transferred from the El Al fleet. 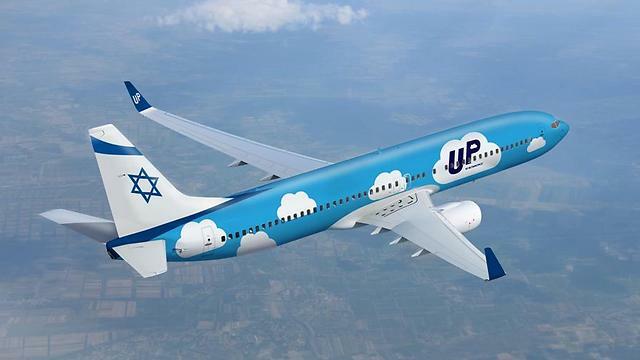 Up was founded by its parent El Al to be used on some routes to Europe where it replaced El Al itself. All Up flights were operated by El Al, using El Al's call sign and codes with a four digit number. For flights over two hours the airline offered a buy on board service. In August 2014, Ryanair CEO Michael O'Leary foreshadowed the development of a Ryanair Israel, connecting Israel with cities across Europe. He said an inhibiting factor in the plan was Israeli authorities' protectiveness of El Al from competition. The CEO of Up wished to recreate the airline business world. Ryanair started serving Ovda Airport and Ben Gurion Airport in the winter season 2017/18 from several airports throughout Europe. Up ceased operations on 14 October 2018. All of its six destinations and fleet were reintegrated into mainline El Al operations. The main business of Borenstein, a company (fully owned by El Al) registered in the U.S. and operating at New York's JFK airport, is the production and supply of kosher ready meals to airlines and other institutions. As a prime target for terrorism, El Al employs stringent security procedures, both on the ground and on board its aircraft. These effective, though time-consuming and discriminatory procedures have won El Al's security reputation. In 2008, the airline was named by Global Traveler magazine as the world's most secure airline. Since the early 2000s, El Al has been the only commercial airline to fit its planes with systems to defend against anti-aircraft missiles. In 2014, El Al began to fit some of its planes that fly on more sensitive routes with an updated missile approach warning system (MAWS) that employs an infrared missile-tracking camera, an “infrared (IR), ultra-violet (UV), or radar missile-approach warning sensor to detect a missile launch in the very early stages of an attack” and a laser system to act as a counter-measure. In November 2014, under the Israeli government's SkyShield programme, Elbit's Commercial Multi-Spectral Infrared Countermeasures (C-MUSIC) system was adopted by El Al. "C-MUSIC is one of the biggest and most complex projects ever undertaken at Elbit and in Israel". At Israel's Ben Gurion Airport, plainclothes agents and fully armed police or military personnel patrol the premises for explosives, suspicious behavior, and other threats. Armed security personnel also patrol El Al terminals overseas. Inside the terminal, passengers and their baggage are checked by a trained team. El Al security procedures require that all passengers be interviewed individually prior to boarding, allowing El Al staff to identify possible security threats. Passengers are asked questions about their place of origin, the reason for their trip, their job or occupation, and whether they have packed their bags themselves. El Al believes interviewers can spot signs of nervousness. At the check-in counter, passengers' passports and tickets are closely examined. A passport without a sticker from the security checkers will not be accepted. At passport control passengers' names are checked against information from the FBI, Canadian Security Intelligence Service (CSIS), Scotland Yard, Shin Bet, and Interpol databases. Luggage is screened and sometimes hand searched. In addition, bags are put through a decompression chamber simulating pressures during flight that could trigger explosives. Even at overseas airports, El Al security agents conduct all luggage searches personally, even if they are supervised by government or private security firms. The airline was criticized by Hungarian courts for refusing to search luggage with the passenger present, acting against Hungarian domestic laws stipulating that only authorized officials are able to undertake such searches. In 2008, a civil case was brought to the Supreme Court of Israel by the Association for Civil Rights in Israel, which alleged that El Al's practice of ethnic profiling illegally singled out Arab passengers for tougher treatment. The group had petitioned "for the complete elimination of racial profiling" by the airline. In 2015, the court dismissed the petition on procedural grounds, accepting in part the government's argument "that it could not completely change without heavily burdening all travelers," but reimbursing the Association for Civil Rights in Israel a total of NIS 30,000 for its legal fees, and finding that the petition "had already gotten security to be less discriminatory." The court left the door open for a renewed petition in the future if required. In September 2014 it was reported that there have been repeated incidents where some ultra-Orthodox male passengers refused to sit next to women passengers, sometimes delaying flights. As result, a petition was initiated with Change.org to pressure El Al to alter their policy of allowing ultra-Orthodox passengers on flights to negotiate switching seats. The petition reads: "Why does El Al Airlines permit female passengers to be bullied, harassed, and intimidated into switching seats which they rightfully paid for and were assigned to by El Al Airlines? One person's religious rights do not trump another person's civil rights." In November 2014 Tova Ross in the Forward; disagreed that this is discrimination against women. She wrote, "...If we [women] want the right to pray and practice and dress in the ways we see fit, why do we cast such caustic aspersions on the premise of a man who calmly asks to change his seat in order for him not to stray from his preferred religious outlook?"... "A favor for a fellow human being, no matter how archaic we may deem his beliefs. We are indulging a request that we may neither understand nor agree with, but if it doesn’t really put us out, if the flight isn’t full and there is in fact someone who will easily volunteer to switch seats, then what is everyone’s colossal problem with the mere premise?" In February 2016, Renee Rabinowitz filed a successful lawsuit against El Al after being involved in an incident where an ultra-Orthodox man refused to sit next to her on a flight from Newark International Airport to Tel Aviv and the flight attendants asked her to move seats. Later in 2018, the airline decided to immediately remove any passengers who refuse to sit next to a woman. El Al serves destinations on four continents in 31 countries with a well-developed European network that also takes in important cities in Russia. The airline serves a number of gateway cities in North America and has expanded its service to cover central and southeast Asia (Bangkok, Mumbai) and the Far East (Beijing and Hong Kong). However, El Al's inability to overfly Saudi Arabian airspace, along with that of several other Arab and Muslim countries, has reduced their ability to further expand their route network in Asia. Saudi Arabia has recently granted permission to Air India to fly a thrice weekly flight from Tel Aviv to New Delhi using Saudi Arabian airspace. If Saudi Arabia does not allow El Al to use their airspace, El Al might lose a large share of their Asian market due to other airlines having shorter and cheaper flights. However, the recent contacts between Israeli and Saudi officials may change the Saudi position. It also offers services to Johannesburg in South Africa and Zanzibar. Boeing 767-300ER - retired in 2019. 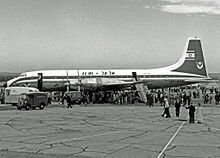 El Al's historic, superseded livery featured a turquoise/navy blue stripe down the side of the aircraft, and a turquoise tailfin with the flag of Israel at the top. El Al's logo was featured above the front run of windows on each side of the plane in the turquoise/navy scheme. The new livery features a blue stripe with a thick silver border on the bottom that sweeps across the side of the aircraft near the wing, disappears over the top of the plane and reappears at the bottom of the tailfin. The El Al logo is part of the design, although it has been changed slightly since then. Most of El Al's aircraft are named for Israeli cities, such as Jerusalem, Tel Aviv, Bet Shemesh, Nazeret, Haifa, and others. The larger the aircraft - the bigger or more populated the city it is named after. The cities' names are located near the nose of the plane beneath the cockpit windows. One aircraft, a Boeing 787-9 Dreamliner, is painted in the livery that El Al used in the 1960s and 1970s as part of the airline's 70th year of operations, using a gray belly, white roof with El Al titles, a blue cheatline, and the flag of Israel on the vertical stabilizer that was introduced with the introduction of the Boeing 707 to the El Al fleet. By contrast, El Al's cargo plane livery in the past lacks the painting of Israel's flag and its airline identity; only a word "Cargo" appears on the fuselage. Subsequently, the newer cargo plane livery (including the current Boeing 747-400F) has the airline identity painted but otherwise it is painted in white. The King David Lounge is the name adopted by El Al for special airport lounges that serve the airline's premium class passengers. There are six King David Lounges worldwide at the key airports at Ben Gurion International Airport, John F. Kennedy International Airport in New York, Newark Liberty International Airport, Paris-Charles de Gaulle Airport, London Heathrow Airport and Los Angeles International Airport. All King David Lounges offer drinks, snacks, newspapers and magazines (Israeli and foreign), while some lounges also offer free Wi-Fi internet access. The King David Lounge at Terminal 3 at Tel Aviv-Ben Gurion airport is equipped with a telephone, shower facilities and a spa; it has a separate section for first-class passengers. First class - Boeing 747-400 and Boeing 777-200ER. First class is in a 2-2 configuration and has a pitch of 79" and 23" wide. Business class - on all planes (type of business seat changes with type of aircraft). Business class on the 787 is in a 1-2-1 configuration while the 777 and 747 are in 2-3-2 business class configuration. Business class on the 747, 777 has a seat pitch of 55" and 19.5" wide. On the 787, the dimensions are 78" and 23" respectively, and 44" and 20.5" on all 737 aircraft. Premium economy class - on all wide-body aircraft. Same configuration as economy on the 747 and 777 with 36" seat pitch, and is branded as “Economy Plus”. On the 787, the seat pitch is 38" with an 18.5" wide seat, in a 2-3-2 configuration and is branded as “Premium Economy”. Economy class - All planes. 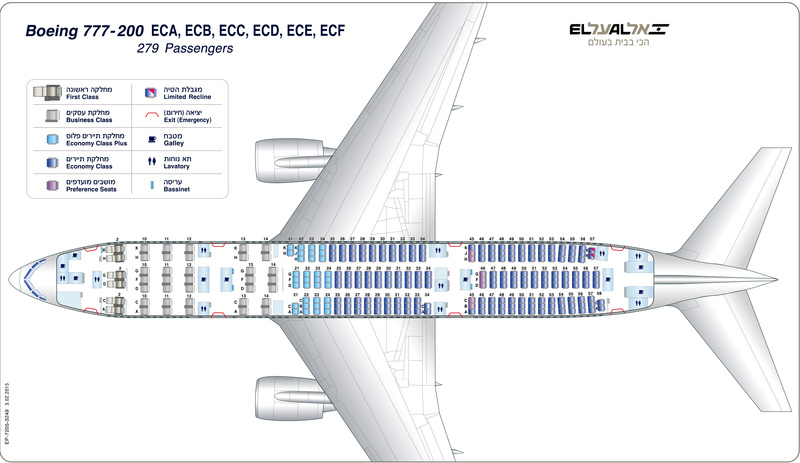 Economy class has a seat pitch of 32" (31" on the 787) and 18" seat width (17" on the 737 and 787). Personal AVOD screens are provided on all Boeing 777-200ER, Boeing 747-400 and Boeing 787s. Streaming with iPads and smartphones by an El Al app is provided on the Boeing 737-900ER and some Boeing 737-800, where there are no personal AVOD screen. Over its history, El Al has been involved in the following incidents and accidents, involving both the aircraft actually operated by the airline and its outstations abroad. Most of these incidents are related to Palestinian terrorism, particularly in the period between 1968 and 1990, and so incidents are separated by terrorist and non-terrorist incidents. Despite these attacks, EL Al has not lost a passenger on any passenger flight since 1955. 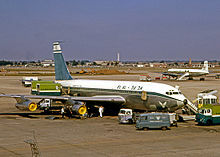 On 23 July 1968, El Al Flight 426, operated by a Boeing 707-458C en route from London to Tel Aviv via Rome, registered 4X-ATA, was hijacked by three members of the Popular Front for the Liberation of Palestine (PLFB) shortly after take-off from Rome-Fiumicino airport and forcibly diverted to Algiers. The hijacking ended after 40 days and is considered to be the only successful hijacking involving an El Al jet. On 18 February 1969, El Al Flight 432, operated Boeing 720-058B, registered 4X-ABB, was attacked at Zürich airport by members of the PLFB while taxiing for takeoff en route from Amsterdam to Tel Aviv, via a Zurich intermediate stop. An Israeli trainee co-pilot was shot, who died a month later from his injuries, with another eight people being wounded. In a firefight involving security personnel aboard the aircraft, one hijacker was killed, while the others were arrested. The hijackers were later put on trial in Winterthur, Switzerland but released following the hijacking of a Swissair aircraft one year later. On 6 September 1970, El Al Flight 219 from Tel Aviv to New York, with a stopover in Amsterdam, operated by a Boeing 707-458C registered 4X-ATB, was the target of an attempted hijacking by Leila Khaled and Patrick Argüello, members of the Sandinistas working in concert with the PLFB after taking off from Amsterdam. The hijacking was meant to be one of the Dawson's Field hijackings, but it was thwarted by the pilot and on-board air marshal. The aircraft diverted to Heathrow Airport, where Argüello and Khaled were turned over to British authorities; Argüello, who was shot earlier, died en route to a hospital. On 16 August 1972, a bomb exploded in the luggage compartment of El Al Flight 444 shortly after takeoff from Rome. The plane returned to Rome safely and no casualties were recorded. The bomb had been hidden in the luggage of two British nationals who had the bombs placed there by Arab acquaintances. On 13 January 1975, several men, including Carlos the Jackal, made an unsuccessful attempt to destroy an El Al airliner parked at Paris Orly Airport. The men tried again on January 17, also without success. On 27 December 1985, after several failed attempts to attack El Al aircraft, guerrillas of the Fatah Revolutionary Council attacked El Al and TWA ticket counters at Rome-Fiumicino and Vienna-Schwechat airports, killing 18 people. A terrorist attack was foiled on 18 April 1986 in what became known as the Hindawi Affair. A pregnant Irishwoman named Anne-Marie Murphy was about to board an El Al flight at London's Heathrow airport when her bag was found to contain three pounds of plastic explosives. These had been planted by her fiancé Nezar Hindawi, who was booked on a different flight. Hindawi was jailed for 45 years, the longest sentence (short of a life sentence) ever delivered by a British court. There was evidence that Syrian officials were involved and as a result, Britain cut off diplomatic relations with Syria. On 4 July 2002, Hesham Mohamed Hadayet shot six Israeli passengers (resulting in two deaths) at El Al's ticket counter at Los Angeles International Airport before he was shot and killed by an El Al security guard. Two of the victims died. Although not linked to any terrorist group, Hadayet, an Egyptian, espoused anti-Israeli views and was opposed to US policy in the Middle East. The US Federal Bureau of Investigation classified the shooting as a terrorist act, one of the few on US soil since the September 11, 2001 attacks. On 17 November 2002, El Al FLight 581, a flight operated by a Boeing 767-258(ER) from Tel Aviv to Istanbul, registered 4X-EBS, was the scene of an attempted hijacking by Tawfiq Fukra, a twenty-three-year-old Israeli Arab reportedly armed with a pocket knife. Fukra attempted to break into the cockpit in order to fly the aircraft back to Israel and crash it into a building. He was apprehended by on-board security personnel. On 24 November 1951, a Douglas DC-4, registered 4X-ADN, on a cargo flight from Tel Aviv to Amsterdam via Zürich crashed on approach to Zürich , killing 6 crew members. On 27 July 1955, a Lockheed Constellation operating El Al Flight 402, registered 4X-AKC, was shot down by two Bulgarian Air Force fighter jets over Blagoevgrad, near Sofia, Bulgaria, after it strayed into Bulgarian airspace in rough weather. All 58 passengers and crew were killed. On 4 October 1992, El Al Flight 1862, a cargo flight from New York to Tel Aviv via Amsterdam, operated by a Boeing 747-258F cargo plane registered 4X-AXG, crashed into two highrise apartment buildings (Kruitberg and Groeneveen) in Bijlmermeer, a neighborhood of Amsterdam, shortly after takeoff and while attempting to return to Amsterdam. The crash was caused by structural failure of the fuse pins on the #3 engine, causing that engine to detach from the aircraft, knocking off the #4 engine with it, causing the aircraft to roll to the right. The three crew members, one passenger in a jump seat, and 39 people on the ground were killed. ^ "El Al Flight Schedule". El Al. Retrieved 20 April 2017. ^ "TASE Site – Profile". Tase.co.il. 2010-01-07. Retrieved 2014-07-18. ^ United States. "ELAL Israel Airlines LTD". Seabury APG. Retrieved 2013-07-04. ^ "Israel special – Flag carrier El Al thrives despite high fuel costs and competition". Flightglobal. 11 February 2008. Archived from the original on 25 May 2014. ^ a b "EL AL named most secure airline". The Jerusalem Post. 2008-02-06. Retrieved 2008-02-06. ^ "El Al secure because it must be". CNN. 2002-07-05. Retrieved 2016-05-15. ^ Kohn, David (February 11, 2009). "The Safest Airline". CBSnews. Retrieved 2012-04-12. ^ a b Walt, Vivienne (January 10, 2001). "Unfriendly skies are no match for El Al". USA Today. Retrieved April 29, 2007. ^ a b "Aviation World Records". Think Quest. Archived from the original on 2007-02-28. Retrieved 2007-05-07. ^ a b Brinkley, Joel (May 26, 1991). "Ethiopian Jews and Israelis Exult as Airlift Is Completed". The New York Times. ^ Orme, William A. Jr. (March 5, 1999). "El Al at a Turning Point; A Mirror of Israel's Divisions Prepares to Go 49% Public". The New York Times. Retrieved February 15, 2010. ^ Wagner, Matthew (2006-12-06). "Another report of non-kosher food on El Al plane". The Jerusalem Post. Retrieved 2012-04-12. ^ a b "El Al, Major financial and operational statistics for 2016" (PDF). El Al. March 2017. Retrieved 2018-02-06. ^ a b "El Al, Major financial and operational statistics for 2011" (PDF). El Al. March 2012. Retrieved 2018-02-06. ^ a b c d e f g h i j k l m n o p "El Al Company History". Answers.com Premium Partner. Retrieved 2007-05-27. ^ Kanon, Sharon (April 7, 2000). "El Al flies to rescue throughout the world". Jewish Bulletin. Retrieved 2007-05-07. ^ a b c "El-Al, Israel's Airline". Gates of Jewish Heritage. Archived from the original on 2001-02-22. Retrieved 2007-05-27. ^ a b c d e f g "History of El Al". El Al. Retrieved 2007-05-07. ^ "The Beast in Chains". Time. June 6, 1960. Retrieved 2007-06-20. ^ "Doyle Dane Bernbach". Retrieved 2007-05-28. ^ "El Al, the Israeli Airline". US Centennial of Flight. Retrieved 2007-05-28. ^ "Drama of the Desert: The Week of the Hostages". Time. September 21, 1970. Retrieved 2007-05-07. ^ "Timelines". Raptureready.com. Archived from the original on 2013-05-18. Retrieved 2013-07-04. ^ Levy, Sara. "The General's Rebbe – Life". Chabad.org. Retrieved 2013-07-04. ^ a b "A history of El Al incidents". One News. Retrieved 2007-05-28. ^ "Lebanese International Airways". Aviation Safety Network. Retrieved 2010-02-08. ^ Bard, Mitchell Geoffrey. The Complete Idiot's Guide to the Middle East Conflict. Alpha Books. ^ Tugend, Tom (February 24, 2006). "The Day a New Terrorism Was Born". Jewish Journal. Archived from the original on March 21, 2006. Retrieved 2007-05-07. ^ Avner, Yehuda (2010). The Prime Ministers: An Intimate Narrative of Israeli Leadership. The Toby Press. p. 599. ISBN 978-1-59264-278-6. ^ "Sde Dov/Tel Aviv". Global Security. Retrieved 2007-05-27. ^ Keinin, Herb (November 28, 1991). "El Al flies olim on first direct charter". The Jerusalem Post. Retrieved 2007-05-31. ^ "El Al Airlines posts $15 million profits". Jewish Bulletin Online. 1996-04-26. Retrieved 2007-05-07. ^ "El Al Cargo Profile". El Al. Retrieved 2012-10-03. ^ "Shareholders". El Al. Retrieved 2015-02-17. ^ Friedman, Ron (13 August 2010). "El Al signs agreement with American Airlines". The Jerusalem Post. Retrieved 12 January 2012. ^ "Financial Data". El Al. Archived from the original on November 29, 2006. Retrieved 2007-06-23. ^ "Israel special—Flag carrier El Al thrives despite high fuel costs and competition". Flight International. Flight Global. 2008-02-11. Retrieved 2008-02-23. ^ Blumenkratz, Zohar (2007-06-07). "What irks El Al passengers". Haaretz. Archived from the original on October 1, 2007. Retrieved June 19, 2007. ^ Coren, Ora (June 21, 2007). "Business in Brief- Transport minister: El Al to be compensated for surrendering its monopoly". Haaretz. Retrieved 2007-06-22. ^ Zimmerman, Dana (2007-01-16). "El Al opens King David lounge in Paris". Ynet News. Retrieved 2007-05-07. ^ "El Al's Ace in the Hat: The Boeing 777". infolive.tv. 2007-07-31. Retrieved 2007-10-20. ^ "Airlines race to prevent European flight ban". 2009-02-27. Archived from the original on 2011-09-16. ^ "After 4 years, Israel regains Category 1 aviation safety ranking". ^ Manji, Irshad. The Trouble with Islam Today. Macmillan, March 16, 2005. p. 73. "The flight's safety video, though narrated in Hebrew, had Arabic subtitles." Retrieved from Google Books on November 4, 2012. ISBN 0312327005, 9780312327002. ^ "Financial Information". El Al. 2015. Retrieved January 21, 2016. ^ "UP livery on a 737–800". Retrieved 2014-07-18. ^ a b c d Elis, Niv (2013-11-26). "El Al starting low cost airline". Jpost.com. Retrieved 2014-07-18. ^ "EL AL cancels low-cost brand UP, plans to implement new tourist class format". JOL. 4 January 2018. Archived from the original on 2018-07-14. Retrieved 2018-01-23. ^ "Israel's Sun d'Or has operating licence withdrawn". ^ Vause, John (24 May 2004). "Missile defense for El Al fleet". CNN. Retrieved 2007-11-30. ^ Williams, Dan (February 16, 2006). "El Al Fits Fleet with Anti-Missile System". Reuters. Archived from the original on July 28, 2012. Retrieved 2007-11-30. ^ "IAI/Elta's "Flight Guard" Commercial Aircraft Protection System Funded". Israeli Aerospace Industries. 2003-09-08. ^ Ferran, Lee (July 23, 2014). "Israeli Airline With Missile Defenses Goes to Israel When US Carriers Won't". ABC News. ^ "Israeli-style security might have averted hijackings". USA Today. 2001-09-13. Retrieved 2007-05-07. ^ "El Al wants to do own bag screening at Newark". USA Today. Associated Press. 12 May 2006. Archived from the original on 23 July 2014. ^ "El Al sets security standards". BBC News. 2002-07-05. Retrieved 2007-05-07. ^ a b "Model for air travel security may be El Al". CNN. 2001-09-26. Archived from the original on 2007-06-24. Retrieved 2007-05-07. ^ Silver, Eric (2006-08-15). "Flying under the eagle eyes of El Al's famed high security". New Zealand Herald. Retrieved 2006-08-15. ^ "Israel Increases El Al Security Payments To End Strike Over Open Skies Deal". The Jewish Week. 2013-04-22. Archived from the original on 2013-05-01. Retrieved 2013-07-04. ^ Tarek, Ibrahim (December 2006). "Suspected Citizens: Racial Profiling Against Arab and non Jewish Passengers by Israeli Airlines and Airports" (PDF). Archived from the original (PDF) on 2007-06-28. Retrieved 2007-03-01. ^ Rights Group Says Airport's Racial Profiling Violates Israeli Law, Associated Press (March 20, 2008). ^ a b c Yonah Jeremy Bob, High Court Rules on Racial Profiling at Ben-Gurion Airport: Court dismisses a civil rights petition, but leaves the door open for future cases, Jerusalem Post (March 11, 2015). ^ "Petition asks El Al to get tough on ultra-Orthodox 'bullying and harassing' of female passengers". Haaretz.com. 29 September 2014. Retrieved 24 April 2015. ^ "Ultra-Orthodox Jews delay El Al flight, refusing to sit near women". Washington Post. Retrieved 24 April 2015. ^ "Ultra-Orthodox Jews refuse to sit next to women, delay flight". New York Post. Retrieved 24 April 2015. ^ "El Al 'gender discrimination' may violate U.S. law, claims N.Y. activist rabbi". Haaretz. 1 October 2014. Retrieved 24 April 2015. ^ "About Us". The Forward. Retrieved 2016-06-16. ^ "Don't Judge Hasidic Seat-Switchers". The Forward. Retrieved 2016-06-16. ^ "El Al won't put in place policy on ultra-Orthodox men who refuse to sit by women". Haaretz. 30 September 2014. Retrieved 24 April 2015. ^ "She Was Asked to Switch Seats. Now She's Charging El Al With Sexism". New York Times. 27 February 2016. Retrieved 1 March 2016. ^ "El Al lawsuit could set gender discrimination precedent". Y Net News. 27 February 2016. ^ "Israeli airline to remove passengers who refuse to sit next to women". NBC News. Retrieved 2018-06-27. ^ Berman, Lazar (15 August 2013). "Plane turns back to get cancer patient". Times of Israel. Archived from the original on 15 July 2014. ^ "El Al European Route Map". Airline Route Maps. Retrieved 2007-05-07. ^ "El Al Worldwide Route Map". Airline Route Maps. Retrieved 2007-05-07. ^ "Profile on El Al". CAPA. Centre for Aviation. Archived from the original on 2016-10-29. Retrieved 2016-10-29. ^ Liu, Jim (22 September 2017). "Aerolineas Argentinas / El Al begins codeshare partnership from Sep 2017". Retrieved 22 September 2017. ^ Liu, Jim (7 September 2017). "El Al / Qantas codeshare partnership begins in Sep 2017". Routesonline. Retrieved 7 September 2017. ^ Liu, Jim (12 November 2018). "El Al / Vietnam Airlines begins codeshare partnership from Nov 2018". Routesonline. Retrieved 12 November 2018. ^ a b c Pallini, Thomas (2018-07-26). "El Al Goes Retro with New 787 Special Livery". Airline Geeks. Retrieved 2018-08-23. ^ "Israel Travel — Our Fleet". Retrieved 2017-10-09. ^ "El Al's plans to buy 787s will allow fleet renewal, perhaps expansion. Hainan, Cathay to Tel Aviv?". CAPA Centre for Aviation. 2015-08-10. Retrieved 2016-10-15. ^ "Rolls-Royce and El Al sign 787 Trent 1000 service deal". Flightglobal.com. Retrieved 2017-01-16. ^ "El Al outlines 787-8 network from Nov 2019". routesonline.com. 24 March 2019. ^ "EL AL Retiring the Last of its Boeing 757 Aircraft from Service | EL AL Airlines". Elal.co.il. 2012-11-26. Retrieved 2013-07-04. ^ "El Al Superseded Livery". Airliners.net. Retrieved 2007-05-07. ^ "El Al New Livery". Airliners.net. Retrieved 2007-05-07. ^ "Matmid Club" (PDF). Superstar Travel. Retrieved 2007-05-07. ^ "El Al Partner Airlines". El Al. Retrieved 2007-05-07. ^ "El Al King David Lounge". El Al. Retrieved 2007-05-07. ^ "El Al King David Lounge Spa". El Al. Retrieved 2007-05-07. ^ "ASN Aviation Safety Database - El Al Israel Airlines". Retrieved 23 August 2018. ^ "El Al hijack". Archived from the original on 2013-07-29. Retrieved 2008-01-20. ^ Ginsburg, Mitch (24 March 2014). "How to thwart a gunman at 29,000 feet, by the only pilot who ever did". Times of Israel. Retrieved 10 July 2015. ^ Ensalaco, Mark (2008). Middle Eastern terrorism: from Black September to September 11. University of Pennsylvania Press. p. 80. ISBN 978-0-8122-4046-7. ^ Kushner, Harvey W. (2003). Encyclopedia of Terrorism. London: Sage Publications. p. 322. ISBN 0761924086. Retrieved 5 October 2015. ^ Booth, Jenny (2004-10-13). "El Al bomber too dangerous to release, court rules". London: Times Online. Archived from the original on March 10, 2007. Retrieved 2007-05-23. His sentence of 45 years is believed to be the longest specific jail term ever imposed by an English court. ^ Daniel Pipes (Spring 1989). "Terrorism: The Syrian Connection". The National Interest. Retrieved 2007-05-07. ^ "Los Angeles airport shooting kills 3". CNN. 2002-07-05. Archived from the original on 2004-12-04. Retrieved 2007-05-28. ^ "FBI, Justice: El Al attack was terrorism". CNN. 2003-04-12. Archived from the original on February 3, 2007. Retrieved 2007-04-29. ^ "Passengers recall El Al 'hijack' terror". BBC News World Edition. 2002-11-18. Retrieved 2007-05-30. ^ Fisher, Ian (2002-11-27). "Man Denies Trying To Hijack El Al Plane". The New York Times. Retrieved 2007-05-30. ^ Ashkenazi, Eli; Khoury, Jack (2005-10-11). "El Al hijacker released to house arrest". Haaretz. Retrieved 2007-05-30. ^ "ASN Aircraft accident description Douglas DC-4 4X-ADN — Zürich-Kloten". Aviation Safety Network. Retrieved 2007-05-29. ^ "Through the Curtain". Time. 1955-08-08. Retrieved 2007-05-23. ^ "ASN Aircraft accident description Lockheed L-149 Constellation 4X-AKC — Petrich". Aviation Safety Network. Retrieved 2007-05-29. ^ Melman, Yossi. "An investigation behind bars". Haaretz. Archived from the original on May 17, 2008. Retrieved 2007-10-20. ^ "Accident description El Al 1862". Aviation Safety. Retrieved 2007-05-07.